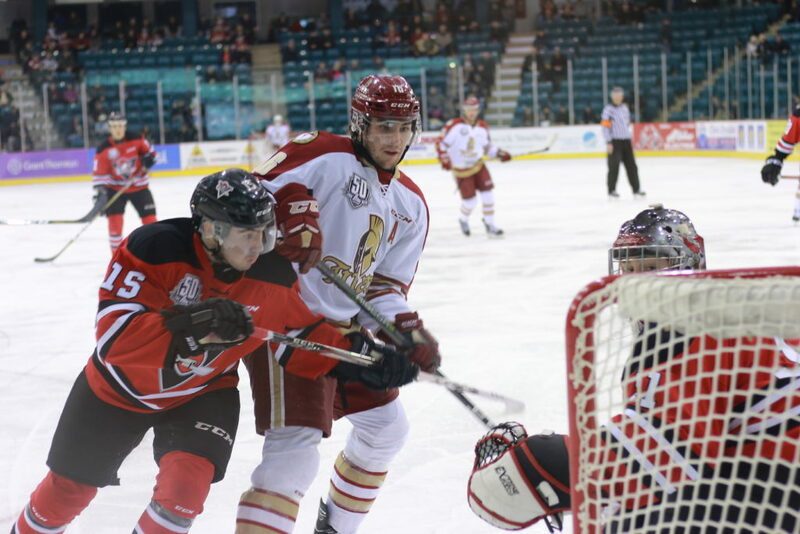 BATHURST – With the Drummondville Voltigeurs in town on Saturday night, not many people were betting on the Acadie-Bathurst Titan to pick up a win. In fact, most probably expected a lopsided result. That was not the case as the Titan took the second place Voltigeurs to overtime and even lead 3-1 at one point. Pavel Koltygin’s 19th of the season gave the Voltigeurs a 1-0 lead 3:59 into the game on a powerplay. Rookie forward Alexandre David scored his second of the season at 16:40 to even it up at a goal apiece assisted by Mathieu Samson and Felix-Antoine Drolet. It would stay 1-1 through 20 minutes of action. Six minutes into the second period Jesse Sutton deflected the puck in front and it got up over Anthony Morrone to give the Titan a 2-1 advantage. William Champagne and Marc-Andre LeCouffe picked up the assists. Four minutes later 16-year-old forward Nicolas Kingsbury-Fournier ripped a shot into the bottom right corner of the net to extend the home teams lead to 3-1. His fifth of the season was assisted by David and Samson. Marc-Olivier Duquette cut the Voltigeurs deficit to one just 26 seconds later and it was 3-2 after two periods of play. A powerplay tally from Joseph Veleno 3:45 into the third frame brought the game back to even 3-3. Mark Grametbauer stood on his head the rest of the way to help the Titan take it into overtime. In the overtime period both squads had their chances but it was a defensive laps by the Titan that allowed Veleno to one-time a shot past Grametbauer at 2:43 to lift the Voltigeurs to a 4-3 victory.